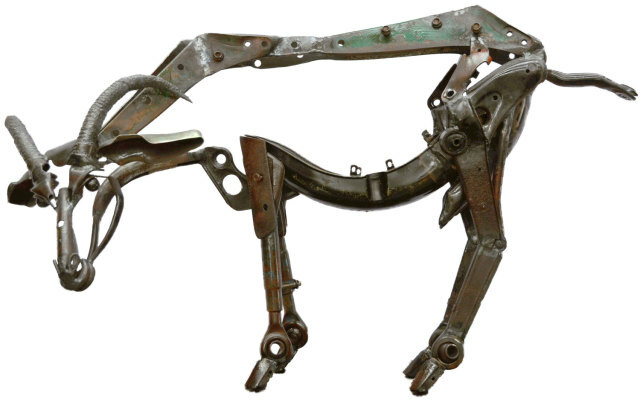 Helen Denerley is one of the UK’s leading wildlife artists, best known for the animals she sculpts from scrap metal. She has had many major exhibitions (including four solo shows at Kilmorack) and has large works in many public spaces throughout the UK, including Edinburgh’s ‘Dreaming Spires’ Giraffes at the top of Leith Walk, and international commissions in Japan, Hong Kong and South Georgia. For Denerley, the creative process begins with meticulously observed drawing and ends with a metal sculpture pulsing with life and movement. This is not rendered in solid form but realised in negative spaces, filled with the spirit of the animal and the viewer’s imagination. Denerley graduated from Gray’s School of Art, Aberdeen in 1977. Since then she has lived and worked from her studio on a remote hillside in Northeast Scotland.